The stock market has been rising relentlessly since Christmas, riding on a crest of increasingly bearish economic reports. Maybe the hedge fund algos are anticipating that the Fed will soon start cutting rates. Data indicates foreigners and retail investors are pulling cash from U.S. stocks. This for me implies that the market is being pushed higher by hedge fund computer algos reacting to any bullish words that appear in news headlines. For example, this week Trump and Kudlow have opportunistically dropped “optimistic” reports connected to trade war negotiations which trigger an instantaneous spike up in stock futures. The real economy continues to deteriorate, both globally and in the U.S. At some point the stock market is going to “catch down” to this reality. The graphic above shows Citigroup’s Economic Data Change index. It measures data releases relative to their 1-yr history. A positive reading means data releases have been stronger than their year average. A negative reading means data releases have been worse than their 1-yr average. The index has been negative since the spring of 2018 and is currently well south of -200, its worst level since 2009. I’m not sure how any analyst who expects to be taken seriously can look at the graphic above and try to explain that an inverted yield curve this time around is irrelevant. As you can see, the last two times the Treasury curve inverted to an extreme degree, the stock bubbles began to collapse shortly thereafter. The data in the chart above is two weeks old. The current inversion is now nearly as extreme as the previous two extreme inversions. This is not to suggest that the stock market will go off the cliff next week. There’s typically a time-lag between when the yield curve inverts and when the stock market reacts to the reality reflected in an inverted curve. Prior to the great financial crisis, the yield curve began to invert in the summer of 2006. However, before the tech bubble popped, the yield curve inversion coincided with the crash in the Nasdaq. The Conference Board’s measure of consumer confidence dropped in March, with the Present Situation index plunging to an 11-month low. It was the biggest monthly drop in the Present Situation index since April 2008. What’s interesting about this drop in confidence is that, historically, there’s been an extraordinarily high correlation between the directional movement in the S&P 500 and consumer confidence. The move in the stock market over the last three months would have suggested that consumer confidence should be soaring. The Cass Freight Index for February declined for the third straight month. Even the perma-bullish publishers of the Cass newsletter expressed that the index “is beginning to give us cause for concern.” The chart of the index has literally fallen off a cliff. Meanwhile, the cost of shipping continues to rise. So much for the “no inflation” narrative. The Cass Index is, in general, considered a useful economic indicator. Perhaps this is why Kudlow wants an immediate cut in the Fed Funds rate? The post-Christmas stock rally extended through Wednesday as the small-cap and tech stocks led the way, with the Russell 2000 up 14.3% and the Nasdaq up 12.5%. The SPX and Dow are up 10.4% and 10.1% respectively. During the stretch between December 26th and January 17th, the Russell 2000 index experienced only two down days. The stock market has gone “Roman Candle” since Fed Chairman, Jerome Powell, gave a speech that was interpreted as a precursor to the Fed softening its stance on monetary policy. Not that intermittent quarter-point Fed Funds rate nudges higher or a barely negligible decline in the Fed’s balance sheet should be considered “tight” money policy. Credible measures of price inflation, like the John Williams Shadowstats.com Alternative measure, which shows the rate of inflation using the methodology in place in 1990, show inflation at 6%. The Chapwood Index measures inflation using the cost of 500 items on which most Americans spend their after-tax income. The index is calculated for major metro areas and has inflation averaging 10% (The John Williams measure which uses 1980 Government methodology also shows the current inflation at 10%). Using the most lenient measure above – 6% current inflation – real interest rates are negative 3.5% (real rate of interest = Fed Funds – real inflation). 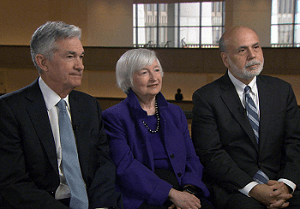 The “neutral” interest rate would reset the Fed Funds rate to 6%. In other words, the Fed should be targeting a much higher Fed Funds rate. In truth, the economy is not “booming” and the employment report was outright fraudulent. The BLS revised lower several prior periods’ employment gains and shifted the gains into December. The revisions are not published until the annual benchmark revision, on which no one reports (other than John Williams). Not only will you never hear or read this fact from the mainstream financial media and Wall Street analysts, most if not all of them are likely unaware of the BLS recalculations. The housing market is deteriorating quickly. 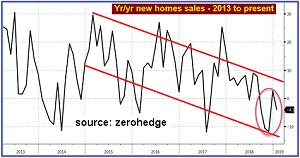 Housing and all the related economic activity connected to homebuilding and home resales represents at least 20% of GDP. And the housing market is not going to improve anytime soon. According to a survey by Fannie Mae, most Americans think it’s a bad time to buy a home even with the large decline in interest rates recently. 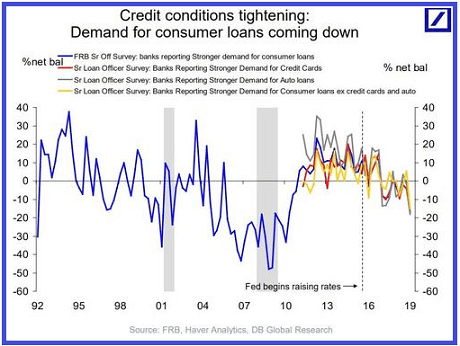 Several other mainstream measures of economic activity are showing rapid deterioration: factor orders, industrial production, manufacturing, real retail sales, freight rates etc. 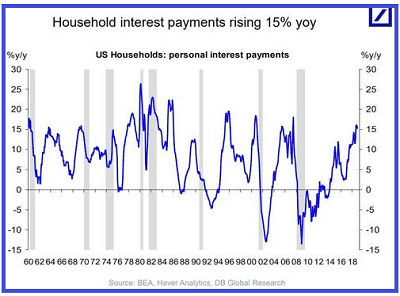 Moreover, the average household is loaded up its eyeballs with debt of all flavors and is sitting on a near-record low savings rate. 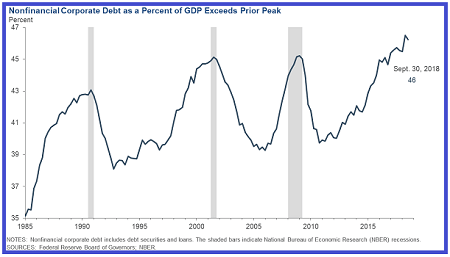 Corporate debt levels are at all-time highs. In truth the economy is on the precipice of going into a tailspin. The stock market is the only “evidence” to which Trump and the Fed can point as evidence that the economy is “strong.” Unfortunately, over the last decade, the stock market has become an insidious propaganda tool, used and manipulated for political expediency. The stock market can be loosely controlled by the Fed using monetary policy. The stock market can be directly controlled by the Working Group on Financial Markets – a subsidiary of the Treasury mandated by a Reagan Executive Order in 1988 – using the Exchange Stabilization Fund. Note: anyone who believes the Exchange Stabilization fund and the Working Group are conspiracy theories lacks knowledge of history and is ignorant of easily verifiable facts. The weekend before Christmas, after a gut-wrenching sell-off in the stock market, the Secretary of Treasury graciously interrupted his vacation in Mexico to place a call to a group of Wall Street bank CEOs to lobby for help with the stock market. The Treasury Secretary is part of the Working Group on Financial Markets. The call to the bank CEOs was choreographically followed-up by the stock market-friendly speech from Powell, who is also a member of the Working Group. The PPT combo-punch jolted the hedge fund algos like a sonic boom. The S&P 500 has shot up 10.8% in the ten trading days since Christmas. It has clawed back 56% of the amount its decline between early September and Christmas Eve. Make no mistake, this nothing more than a temporary respite from what is going to be a brutal bear market. The vertical move in stocks was triggered by official intervention. It has stimulated manic short-covering by the hedge fund computer algorithms and panic buying by obtuse retail investors. Investors are not used to two-way price discovery in the stock market, which was removed by the Federal Reserve and the Government in late 2008. Many money managers and retail investors were not around for the 2007-2009 bear market. Most were not around for the 2000 tech crash and very few were part of the 1987 stock crash. The market’s Pied Pipers have already declared the resumption of the bull market, Dennis Gartman being among the most prominent. More likely, at some point when it’s least expected, the bottom will once again fall away from the stock market and the various indices will head toward lower lows. In the context of well-heeled Wall Street veterans, like Leon Cooperman, crying like babies about the hedge fund algos when the stock market was spiraling lower, I’m having difficulty finding anyone whining about the behavior of the computerized buy-programs with the stock market reaching for the moon. The stock market has become the United States’ “sacred cow.” For some reason stock prices have become synonymous with economic growth and prosperity. In truth, the stock market is nothing more than a reflection of the inflation/currency devaluation caused by the Fed’s money printing and lascivious enablement of rampant credit creation. 99% of all households have not experienced the rising prosperity and wealth of the upper 1%. The Fed’s own wealth distribution statistics support this assertion. It’s been amusing to watch Trump transition from tagging the previous Administration with creating a “big fat ugly stock bubble” – with the Dow at 17,000 – to threats of firing the Fed Chairman for “allowing” the stock market to decline, with the Dow falling from 26,000 to 23,000. If the stock market was big fat ugly bubble in 2016, what is it now? With gold showing good resiliency as it has tested the $1200 level successfully after enduring aggressive paper gold attacks during Comex floor trading hours, it’s only a matter of time before gold breaks out above $1220 and heads toward $1300. Gold has been under attack in the futures market this week as the world’s largest physical gold importer, China, has been closed all week for holiday observance. In addition, with financial market conditions stabilizing in India, the world second largest physical gold importer’s peak gold buying season resumed this week. When gold spikes over $1220, it will unleash an avalanche of short-covering by the hedge funds. Retail, especially the “concept” retailers, are going parabolic. It makes no sense given the declining rate of personal consumption, retail sales, etc. The kinkiest names like RH, RL and W are going up like the dot.com stocks went up in late 1999/early 2000. The move in these stocks reflects either mindless optimism or momentum-rampaging by hedge fund bots – or both. The hedge fund trading flow can turn on a dime and go the other way. I suspect this will happen and, as it does, squeeze even more mindless optimism out of the market. The cost of gasoline has to be hammering disposable income for most households. On top of this is the rising cost of monthly debt service for the average household. Non-essential consumerism is dying on a vine. In just the last eight trading days, XRT has outperformed both the Dow and S&P 500 by a significant margin. It has all indications of a blow-off top in process. You can see that, with industry fundamentals deteriorating, XRT’s current level now exceeds the top it hit at the end of January, which is when the stock market drop began. The RSI has run back into “overbought” status. The retail stocks are setting up a great opportunity for bears like me to make a lot of money shorting the most egregiously overvalued shares in the sector. Timing is always an issue. But complacency has enveloped the stock market once again, as hedge funds have settled back to aggressively shorting volatility. It won’t take much to tip the market over again. Only this time around I expect the low-close of February 8th (2,581 on the SPX) to be exceeded to the downside by a considerable margin. The above commentary was partially excerpted from the the latest issue of the Short Seller’s Journal. It’s not easy shorting the market right now – for now – but there have been plenty of short-term opportunities to “scalp” stocks using short term puts. I cover both short term trading ideas and long term positioning ideas. You can learn more about this newsletter here: Short Seller’s Journal information.